Using the File As... format without (email address) displayed, when people forward emails, messages will not contain the email address visible for others, just the display name, or not accessible for worms or other user's mailbox attackers. This code sample works on the Display name for the default email address (Email1) but can easily be changed to work with Email2 or Email3. To change the File as format on existing contacts, see Bulk Change File As Format for Contacts. Our third "Bulk change Contacts" VBA sample is at Bulk Move Phone Numbers to a Different Phone Field. The Name column (1) is controlled by the Address book setting. Column 2, the email Display Name, defaults to Full Name (email address) format. The code on this page will change this field. To change the Name column (1) in Outlook 2007, the options for the Name column format is at Tools, Account Settings, Address book Tab, double click on the Outlook Address book and choose between Full name or File as format. In Outlook 2010, you'll start at File, Account Settings, Address book Tab, double click on the Outlook Address book. In Outlook 2003 or 2002, go to Tools, Email Accounts, View or Change existing directories or address books. Select Outlook Address Book and click Change to view or change the default for new contacts. 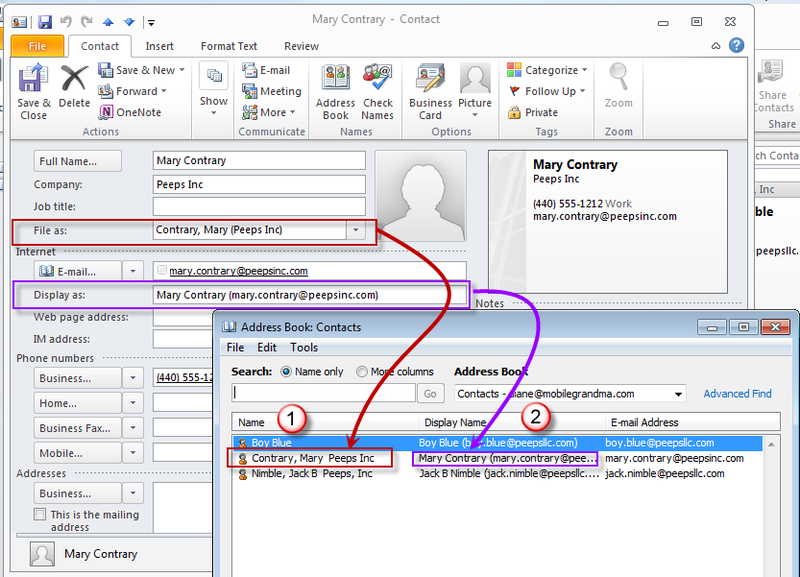 Note that when you edit a contact's email address, the display name is rewritten using Outlook's default format. You'll need to edit it before saving the contact. While you can't change the default settings for the Display Name field (it always uses 'Full name (address)' format), you can use VBA to change your contacts so they all use the same format. Your choices are limited to Full name, Last First, FileAs, and Company. You can include the email address by adding this code to the format code: & " (" & .Email1Address & ")". Not up to working with VBA code? See Tools for tools that can make this change. strFileAs = .CompanyName & " " & .FullName & " (" & .Email1Address & ")"
Results in a leading space if the Contact does not have a Company listed. Uses only the Company name in the display name when the FileAs format is "Company name (Fullname)". Note: I updated the code below to check for email addresses. If an address does not exist, the contact is skipped. Press Alt+F11 to open the VBA editor then copy and paste into ThisOutlookSession. Uncomment the strFileAs line that uses the format you desire before running it. If you have multiple contacts folders, ChangeEmailDisplayName_SelectedContacts will change the selected contacts. It checks for an email address (If .Email1Address <> "" Then) and only updates contacts with email addresses.
' & " (" & .Email1Address & ")"
' strFileAs = .FullName & " (" & .Email1Address & ")"
' strFileAs = .CompanyName & " (" & .Email1Address & ")"
'strFileAs = .CompanyName & " " & .FullName & " (" & .Email1Address & ")"
'Does not support Company (Fullname) format. Thank you so much!!!! This saved me (and, in turn, my grandparents) so much time! It's also given me a chance to take a look at visual basic macros, thanks again for broadening my horizon! I've just run this code and it's worked exactly as I think it should have in that all my contacts Display As fields are now "last name, first name". The reason I'm unsure if this is the outcome that is expected is that this is my first time ever running a macro or using VBA. For that reason also I'm not sure how to change the code to get what I would like, and wouldn't even be confident enough to understand the required changes even if someone has already posted it here (apologies if that's the case and I'm going over old ground). What I would like to do is change all my contacts Display As fields to "Full Name - Company (email)". How should I change the code (currently exactly a is above) to achieve this? strFileAs = .fullname & " - " & .companyname & "(" & .email1address & ")"
Then View menu > Immediate window before running the macro. You'll see the results in the VBA editor. Diane - I recently imported my contacts into a new Outlook 365 account and the sorting and view are different. The card used to show Last Name, First Name followed by Company Name (in the grey area) and then in the card Display As, the Full Name (email address). I tried running a few of your fixes but obviously don't know what I am doing. Please help! Sorry I missed this earlier. Did you get it straightened out? You need to open one contact then click the Full Name button to see if they are in the right fields. If so, the problem is the view - I'd try resetting it or customizing it. outlook 2016 will not send emails using outlook.com with email address in "display as". how do I remove them? but... my guess is the problem is something else as Outlook's default is to create the display name in name (address) format. Is your account on the new server? I tried running the code, but it does not seem to work. It is my first time using VBA and I am not getting any errors when I run it. I think I might be doing something wrong. I currently am running Outlook 2016 with Office. My user has over 1000 contacts and I am unable to get the First Name Last Name to show with the email address in autocomplete when typing in email. There are also times when some addresses do not come up at all when I start typing. By the way, I do have Cached Exchange Mode checked in case you were wondering. Do you have macro security set to low? What type of email account? I know Outlook.com accounts only use full name (address) format for the email display. Thanks for the quick response - it is a Microsoft Exchange account (company run). Outlook is from Office Professional Plus 2010. Even if it does use the full name (address) format since I changed the Full Name field to Last, First wouldn't it use that? All my settings by the way are for Last, First. Outlook will use the full name field format until you clear the display name field - then it will use first last, even if full name and file as use last, first. It should honor your edits to the field though. i'll see if i can repro your problem with the macro - it's been awhile since i last used it. Diane - any luck with this? Thanks. Sorry - did reply but did not show up for some reason. It is a company based Microsoft Exchange type account. Thanks, Diane! Odd that the intermediate step is required, but great that it works!